Not a very impressive base. The Arctic ice has reached its seasonal minimum, and it is now clear that 2014 is the sixth lowest on the satellite record, but still quite a lot icier than 2012. It is exactly in this optimal “window” that Rosneft has announced that the drilling from the Unviersitetskaya platform in the Kara sea did found a nice mixture of oil and gas in one of the 30 “pockets” that were identified as promising. The news made plenty of headlines in the Russian media, but in fact one successful hit can provide only limited data on the volume of the field, so all the speculations about a massive discovery comparable with the resources of Saudi Arbia is just hot air. Igor Sechin, the CEO of Rosneft, expressed so much gratitude to Western partners that a day later he had to clarify that the initiative on opening greater access for IOCs to the Arctic shelf was not his. What is in fact taking place is a withdrawal of Western companies, including the ExxonMobil, from joint projects with Rosneft and Gazprom because of the sanctions regime, so the prospects for further drilling, not to mention development, are in grave doubt. 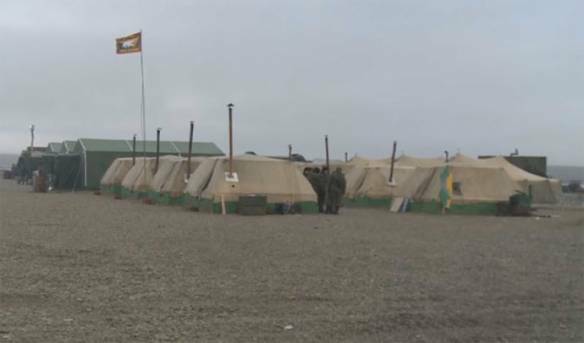 What adds to these doubts is the expansion of Russian militar activities in the Arctic, as various naval and air exercises continue in the Barents sea, while the construction of a new base on the Kotelny island goes on schedule A picture from this base, however, shows mostly tents, so it is small wonder that the airborne troops there engage primaril in survival exercise. Hopefully, the Sevmorput will be kind to this tricky transportation. The new round of US and EU sanctions targets very specifically exploration projects in the Arctic, so both Exxon-Mobil and Statoil announce postponements and cancellations in their respective partnership plans with Rosneft. The Western majors hardly have ay regrets about it – doing business in Russia in general, and with Rosneft in particular, becomes bad for business and damaging for reputation. Russian counter-sanctions include deployment of OMON special units into the IKEA shop outside Moscow. As far as the Arctic is concerned, there is the seasonal peak of military activities, including the voyage of the Northern Fleet ships along the Northern Sea Route, which is not having an ice-free year. What is new this year is the experiment with transporting two nuclear submarines from the Far East to Murmansk. 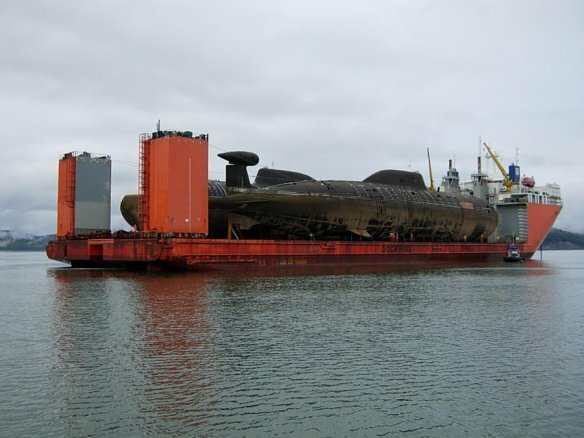 The two submarines in question (both Akula-class, project 971, one built in 1989, another – in 1995) were waiting repairs for a number of years, and now the order was issued to load them on a huge transport ship and bring along the Sevmorput to the Zvezdochka plant near Murmansk. 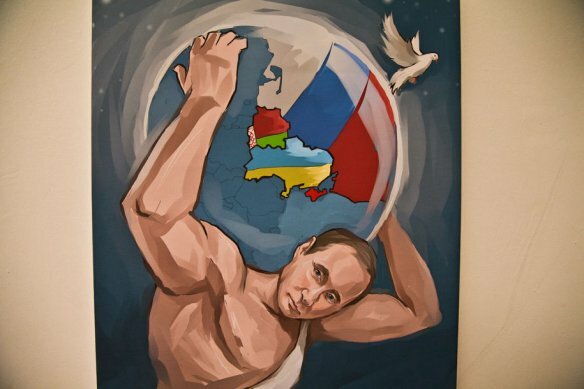 Russian tanks in Novoazovsk are yet to be stopped by NATO strong words. As Russian tanks roll into Ukraine, President Putin promised to act according to the international law in the Arctic. In the same breath, however, he reminded that US strike submarines are concentrated “near Norwegian shores” and their missiles could reach Moscow in 15-16 minutes. The commitment to upgrading the military infrastructure in the High North is executed with great haste, so that on the Wrangel island a new church is erected in the center of re-established military base. The one-sided arms race makes an odd background for the idea of Foreign Minister Sergei Lavrov “to bracket the Arctic out of the military rhetoric”. Lavrov was taking argument with Canadian Foreign Minister John Baird, who said in Copenhagen that Canada was ready to defend its sovereignty in the Arctic against Russian encroachments – and Russian media did not miss that point. Baird is definitely on target – the brazen intervention in Ukraine proves that international law means nothing for the Kremlin, and its commitment to cooperation in the Arctic is good only insofar as it finds it more profitable than a continuation of policy by other means. August is a particular month in the Russian political calendar: It was the Kursk day last week, and this week – it is day of tanks in Prague (21 August 1968) and the day of tanks in Moscow (19-22 August 1991). These days, tanks are rolling over the streets of Donetsk and Luhansk – but the area where Moscow is extra-keen to show its military muscle is – odd as it may seem – the Arctic. Four Su-24 fighter-bombers have performed a special mission and reached the North Pole (with two refueling in the air) – but the report doesn’t say whether they have actually dropped a bomb there. This will hardly add credibility to the claim for expanding the limits of continental shelf, which is supposed to be re-submitted to the UN CLCS by the ed of this year (it was delayed for many years). The chance for this claim to be approved is slim, but Russia is making a big fuss about sending a naval oceanographic ship Admiral Vladimirsky along the Sevmorput with the mission for examining locations for new naval bases. Finnish and Norwegian border guards have less peace and quiet these days as Russian artillery units in the Kola peninsula are exercising their big guns – and are ordered to use five times more rounds than last year. Nobody in the Kremlin appears to have any reflections on the tanks in August – or indeed on the purpose of the one-sided arms race in the High North. 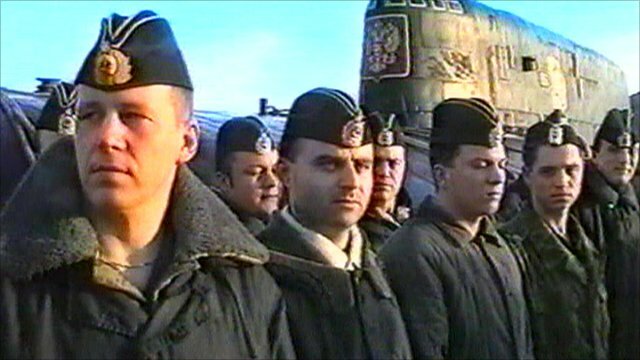 Tommorow is indeed the Kursk day – it was on August 12, 2000 that the proud but unfortunate submarine sunk after an explosion on board during exercises in the Barents Sea. This picture of its crew (from a BBC documentary) marks a moment of remembrace. It is rather striking that on the eve of this day, Russian Defence Ministry proudly reported that a US submarine was found lurking in the Barents Sea – and duly chased away. It is even more striking, that on the same day President Putin held a video conference with the off-shore platform West Alfa in the Kara Sea and praised cooperation with Exxon Mobil (“our old and reliable partner“) that made it possible to start drilling for oil in those difficult waters. This performsance was important in demonstrating that the sanctions were not disrupting joint projects, but in fact, Rosneft has good reasons to be very worried. In Moscow, the policy-makers apparently do not see a conflict between assertive statements on building military presence in the Arctic and pledges to cultivate cooperation. The Kursk tells a different story. Their last moments in the fresh air. In the debates on the impact of tougher sanction imposed by the US and the EU last week, one of the key issues is the scope of problems that Russia will encounter in developing the “green” oil and gas fields in the Arctic. The Economist calls it Arctic Chill, and many other media speculate that Rosneft will have to curtail its exploration. Igor Sechin, the Rosneft CEO, indeed announced his dream to discover a huge oilfield in the Kara Sea, but in fact very little is invested into making this dream come true. With the collapse of the Shtokman project, the exploration of the Arctic shelf has been reduced to minor activity in the current work-plans, and the contract that Rosneft had signed with North Atlantic Drilling Ltd (NADL) worth some $ 4.25 billion just a couple of days prior to the introduction of the sanctions, may go on according to Russian sources, while Sechin’s plan to acquire a share in the NADL is certain to be postponed. What is immediately important, however, is not the Arctic ambitions but the needs of Rosneft and other Russian majors to rehabilitate “brown” fields with Western credits and technologies. The inability to get access to the latter might lead to a serious decline in Russian oil production, but it is remarkable that the global oil market remains completely indifferent to this prospect – the oil priceregisters slight decline last week. This trend should make the Kremlin worried, but it keeps entertaining some Arctic illusions, so that Russian Security Council plans a tour to the Prirazlomnaya platform later this month. 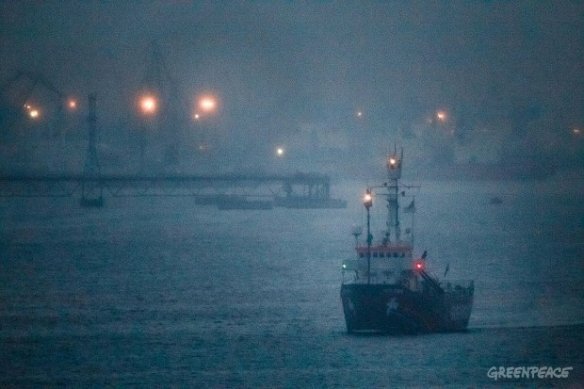 This is the off-shore platform against which Greenpeace staged a protest last year, and if there is one piece of good news on the High North coming from Russia – it is that the Arctic Sunrise ship has finally left Murmansk and is free to sail the seas again. Ministry for the Arctic affairs? A project for setting a ministry for the Arctic region – similar to the recently created ministries for the Far East, the North Caucasus, and the Crimea – is under consideration in the government, according to Nezavisimaya. Any bureaucratic analogy with the Crimean issue should better be avoided, but the article argues proudly that “Events around the Northern continent and its problems take such turns that Putin’s Arctic project in its objectives, the grandiosity of ideas and expenditures may become a continuation of the Crimean enterprise” (my translation). What is known for sure, is that President Putin has issued a set of orders centered on the Artcic (as published on the presidential website last week), one of which instructs the government to take “additional measures towards preventing unauthorized sailing along the Northern Sea Route” (my translation). There are also proposals for supporting scientific research, including on the atlas of the Arctic, but those are certain to remain second priority after the hard-security matters. Exersises aimed at combatting piracy (the Greenpeace actions were mentioned specifically) were conducted recently in the Kola bay. There is also an extensive presentation of plans for rebuilding military infrastructure, firts of all air defense facilities, particularly in the Eastern section of the Northern Sea route. 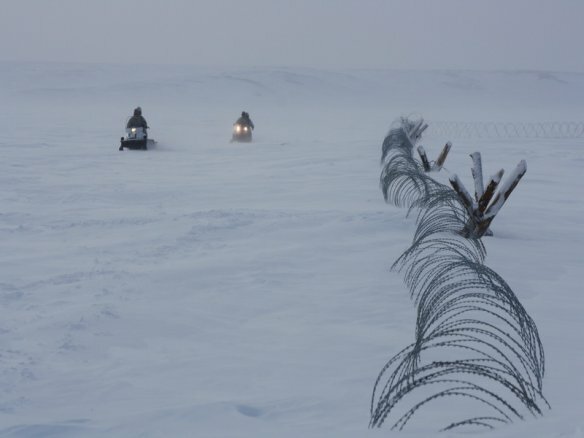 The idea of guarding the Arctic borders Soviet-style is really becoming an executive order (photo from the collection of the Ryazan Airborne Forces Academy). 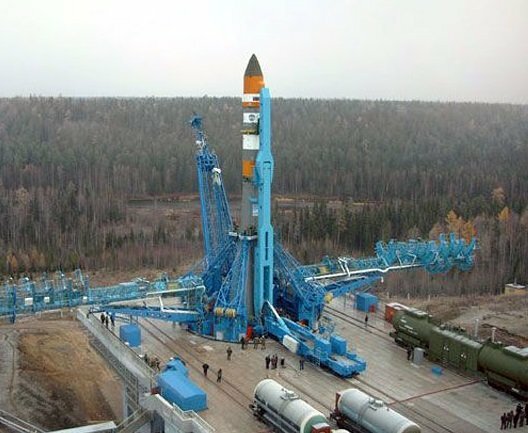 The Angara space rocket in the Plesetsk cosmodrome. Strictly speaking, the Plesetsk cosmodrome is not in the Arctic – it sits on the 63rd parallel, while the Arctic circle goes at 66° 33′ 44″ N. However, it has a prominent place in Russian Arctic policy, so the failure to launch the new Angara space rocket on June 27 is a major setback for this policy. Russian authorities were so sure about the success that Defence Minister Sergei Shoigu had a direct televised video conference from Plesetsk to President Vladimir Putin in the Kremlin, and as Kommersant reports, the last minute fiasco was deeply embarrassing. The analysis that really deserves attention in this context is the report of Chinese Defence Policy Research Center, which argues that China has a right to a share of Arctic resources and will prevent a minority of countries from dominating the region. Interesting point indeed. I have not been able to give due attention to this blog during spring (blame Ukraine) but now I want to upgrade it to a proper PRIO blog, with the link to Facebook, certainly. What has caught my attention recently was Putin-chaired roundtable on the safety of Arctic development in St. Petersburg on June 5. The tone – the theme of full transparency and eco-stability was in the focus – was certainly very different from the “hard security” focus of the Security Council session in mid-April. However, even in the environment-centered debates, the issue of increasing the military presence is emphasized, like for instance, in this article in Nezavisimaya, which argues for more bases and refers the “second strike” doctrine. Sweet-talking about cooperation, Russia goes ahead with the military build-up, and the CEO of “Vysokotochnye kompleksy” enterprise reveals in this interview that the Pantsyr-C1 (SA-22 Greyhound) air-defense system (combines guns and missiles) is tested for the deployment in the Arctic. It is rather ironic that semi-official media complains that Norway goes too slow with re-starting military cooperation with Russia. 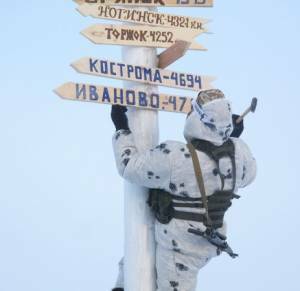 The paratrooper from the 98th Airborne Division (Ivanovo) in this picture seems not too worried about the views of Arctic neighbours.